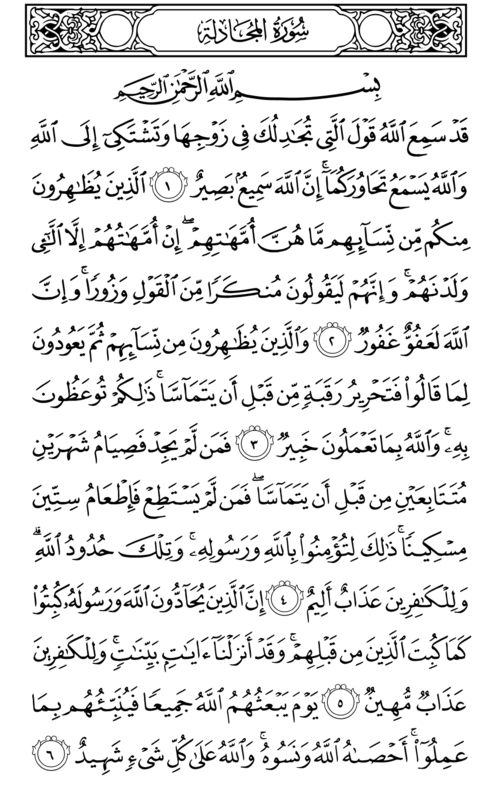 58/Al-Mujadila-1: Allah indeed had heard the word of her who disputed with you about her husband and made her complaint to Allah. And Allah hears your conversing with each other. Surely Allah is All-Hearing, All-Seeing. 58/Al-Mujadila-2: Those amongst you who turn their backs to their wives that they are not their mothers. Their mothers are only those who gave them birth. And most surely they utter a denying (hideous) and sinful word. Most surely Allah is Most-Merciful, Oft- Forgiving. 58/Al-Mujadila-3: They turn their backs to their wives then retract from what they said. In such case he should free a slave before they touch each other. This is what you are advised and Allah is All-Aware of what you do. 58/Al-Mujadila-4: Then whoever cannot find (a slave or concubine to set free), let him fast two consecutive months before touching (his wives). But whoever is not able (to fast), let him feed sixty needy (those who cannot work, elderly). This is because you have faith in Allah and His Messenger, and this is Allah’s limit, and there is a painful torment for the disbelievers. 58/Al-Mujadila-5: Surely those who oppose Allah and His Messenger (Their limits) are abased as those before them were abased. And We had sent down clear Verses (proofs) and for the disbelievers is an abasing torment. 58/Al-Mujadila-6: On that Day Allah will raise them all up (resurrect them). Then will inform them of what they did. Allah has counted of (recorded) what they have forgotten. Allah is a Witness over all things.